IMG scroll banner not working, any idea ? Is it possible to change the main color of the theme? Or, a question formed a bit better - where i could find the settings of color pallette used for main elements like the navbar etc? 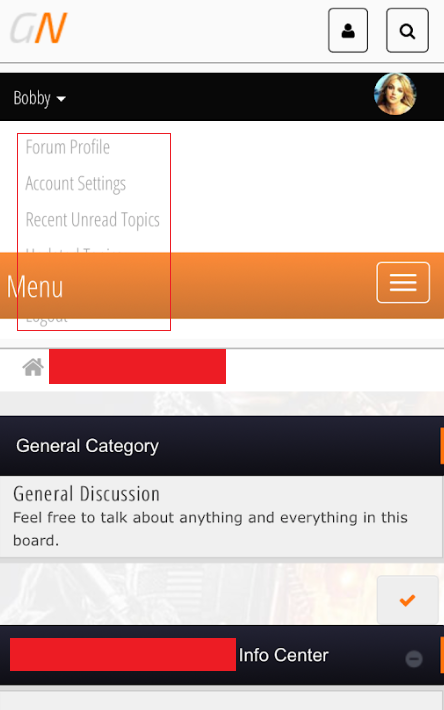 It looks nice, except for the 'off' icons at the left of each forum section listing. I keep tugging at my hair! When I view Gaming Nation on my iPhone the member profile is blocked by the main menu. Any ideas how to fix this issue? You need to use a responsive theme, preferably one with active support. It's coded correctly for pc, but mobile renders it incorrectly. You need a theme that's designed for pc and mobile. So, this theme isn't meant to be responsive for mobile? Thanks, that cleared everything up. Con las disculpas del caso, no hablo ingles. He instalado en mi foro el tema GamingNation - al momento de entrar al listado de mensages el tamaño del tablon se desconfigura quedando hacia un lado y mas pequeño (adjunto foto). Agradesco su ayuda y orientacion.